didn’t intend to spend July in a concentration camp, a Croatian safehouse occupied by child vigilantes and multiple battlefields in Afghanistan and Iraq. 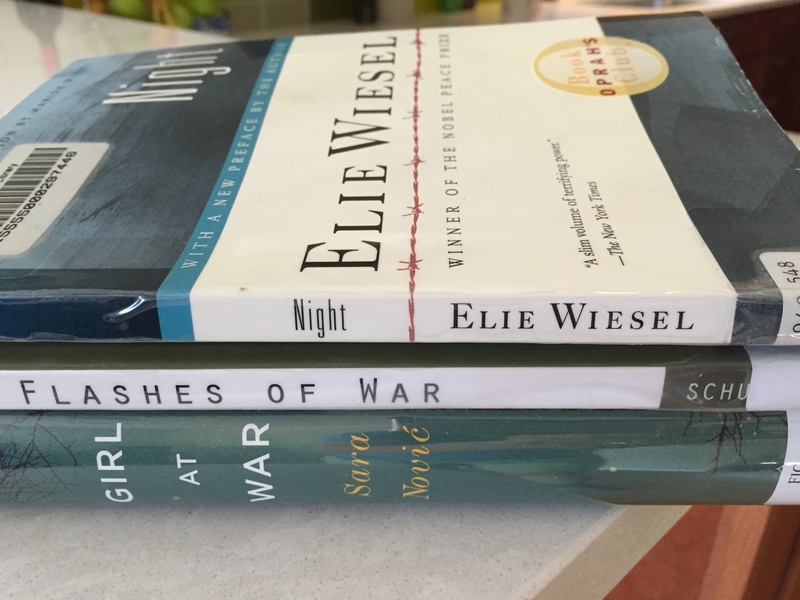 It started with my book club picking Sara Novic’s debut novel Girl at War. Set in 1991 Croatia, 10-year-old Ana becomes a child soldier in a gruesome ethnic conflict after her parents are killed. Lots to think about between these covers. Then I attended an event with author Katey Schultz and so picked up her collection of short stories, Flashes of War, set in Iraq, Afghanistan and the home front. And then Elie Wiesel died, and all the coverage of his humanitarianism mentioned Night, his petrifying memoir of life in Auschwitz. So I read that, too. It was a bit strange, sandwiching the reading in between Fourth of July festivities, beach jaunts and ice cream excursions with visiting, vacationing family members. But the characters were doing the same thing – trying to sandwich in real lives, complete with sick kids and bills to pay – despite the major disruption. The crisis in Novic’s novel arrives when Ana’s family is simply trying to get home and encounters an enemy roadblock. Her father wants so badly to believe they’ll be allowed through that they chance an approach, paying dearly. Likewise in Night, Wiesel and his fellow Jews continuously tried to believe life could get no worse. Stars issued, curfews imposed, ghettoes created, each of the Nazis’ incremental infringement on life, liberty and happiness had to be the last, didn’t it? Alas, it was not. Reading all three in the current American political landscape, it was impossible not to feel an ominous portent. Not so much about Candidate A or B, but more about ourselves. Our human tendency to always forge forward, coping no matter the circumstances, is a great strength. Yet that urge for equanimity can also numb us and reinforce herd behavior instead of standing apart. That’s no excuse for crimes against humanity. But I can’t help wonder if it isn’t a lever that we must, somehow, deny those who seek to manipulate us into becoming our worst selves. Novic’s novel ends with a scene at the Adriatic beach where Ana’s family spent summers before the war. Thanks to these authors, when I head to my own Great Lakes beaches in August, it will be with much more to mull over than SPF and snacks. – The letter I brought to you by Daily Drop Cap.